Pardon the delay but this contest was difficult to judge. We had a total of 37 entries, a new PBE record! (side note, “PBE” is now a recognized acronym at TheFreeDictionary) Myself and the other judges: Cory, Lee and Lori all had different top choices causing recounts, sudden-death voting and peanut butter fights (I won). But we did it. Kinda. There were 4 entries tied for 3rd place so we held a tiebreaker – in the end I decided to leave it as is and bestow the title upon them all. I wish there were prizes for all the contestants but I’m made of peanut butter, not money. Lest we forget the real prizes here, the recipes! Care to see them? Read on for a year’s supply of mouth-watering sandwiches. 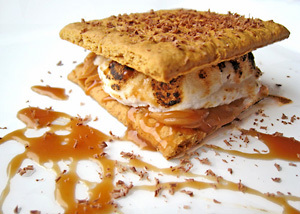 1st Place: Peanut Butter and Caramel Smores by Brilynn at Jumbo Empanadas is the winner by a hair. Perhaps it was the extra caramel sauce talking but while this may not be the most portable “sandwich” it has to be one of the tastiest. Far from being healthy or nutritious, these smores left us drooling for hours and according to her: “I now believe that all smores should be made like this… After you try it my way you’ll be a believer too.” I’m a believer, Brilynn. Enjoy your new cookbook. 2nd Place: The Dunkin Ultimate PB Sammie by the husband of MaryBeth from Dunkin Cookin is the runner-up for an incredibly creative sandwich. I believe I’ve heard rumors of such a sandwich, but they were just that: rumors. Seeing the sharp contrast of colors and flavors somehow makes me crave this sandwich more than I ever thought possible. I tip my hat to you, MaryBeth’s husband. 3rd Place (1 of 4): Maple-Date PB Belgian Wafflewich from Amy at Coffee Talk was a superbly creative idea. A waffle sandwich… all the peanut butter goodness hiding in the pockets and ready to burst! This is only 1 of 3 waffle-sandwich ideas. 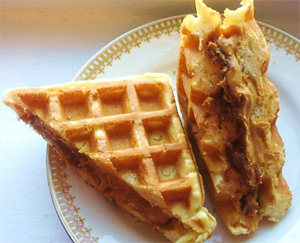 3rd Place (2 of 4): L’eggo my PB & Pumpkin by Bodyblogger is waffle-based entry. This recipe is like a simplified version of the above recipe, giving it extra points in the Prep Time and Portability categories. And there’s still another waffle-sandwich entry down below. Spread one waffle with canned pumpkin. Drizzle honey on top. Spread the waffle with crunchy peanut butter. Marry the two and serve with a side of pumpkin butter for dipping. 3rd Place (3 of 4): Master of Faster Asian Kale Wrap with Tamari-Peanut Spread by Jeremy, a new blogger, from Red Chair Cooking is an excellent recipe that combines a host of delicious ingredients like kale, cauliflower, ginger, cumin, yogurt and of course, peanut butter. This dominated in the Creativity category. 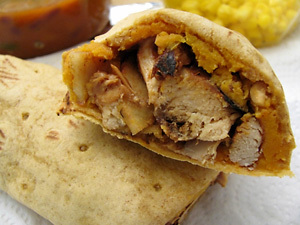 3rd Place (4 of 4): Cinna-Spiced Chicken PB Wrap from Brandi at Bran Appetit gave us a great way to use those leftovers in an all-inclusive, drool-inducing peanut butter wrap. Peanut Butter, Sweet Potato & Apple Sandwich – from What Does Your Body Good? Chocolate Crunch Roll – from Consider This! Banana Bread Peanut Butter Banana Sandwich – from Baking and Boys! 1. Blend the chickpeas, water, PB, lemon juice and garlic in a food processor. Then gradually add in the olive oil until you see a smooth consistency. 2. Scoop the hummus goodness into a pita bread, add some diced tomato and cucumber and you’re ready to eat! 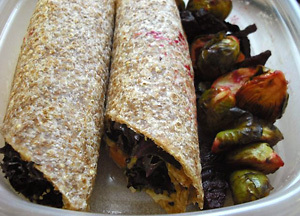 Spread peanut butter (or preferred nut butter) on a flour tortilla. Add chopped banana and honey if desired. Grill or bake until tortilla is golden brown and PB is melty. Layer bacon between peanut buttered toast and fall in love! Click here for the full recipe in PDF format. POKE the dogs liberally with a fork and soak them in the beer for several hours. COOK your favorite way (I boil them gently in the beer until the liquid evaporates). FOR EACH SANDWICH, layer bun (in this order) with Mustard-Berry Onions, Hot Dog, Chipotle Peanut Sauce, and Cheese (optional). PLACE in a warm oven until cheese melts or heated through. Combine peanut butter and marshmallow fluff in a cup and stir until well blended. Spread peanut butter marshmallow mixture onto one side of the bread. Once smooth, drop almonds onto the mixed spread so they are equally distributed over the surface of the bread. Drizzle honey on top of almonds. Put other piece of bread on top, slice diagonally and enjoy. First, pour syrup into skillet on medium heat and stir. Dice the strawberries and then add the strawberries and blueberries to the maple syrup. Continue heating and stir fruit around until coated; it should begin to caramelize. While stirring, place waffles into toaster on desired setting. After waffles are done, spread 1 Tbsp of almond butter on each waffle. Then, take spoon and scoop fruit and syrup mixture on top and assemble sandwich so that bare side of waffles are on the outside. Enjoy warm, possibly with a friend. Slice the baguette in half and place the cheese on top of one side of the baguette. Broil on high in the oven (or toaster oven) for about 3 minutes, or until cheese is warm and melted. Smear on the peanut butter on the other side of the baguette. Place optional condiments on if you like as well. Enjoy with a ice cold iced tea and smell the goodness! Layer each slice with almond-walnut butter and then add lettuce, grilled chicken, cranberry sauce and bleu cheese crumbles. Toasted the sandwich in a pan until the cheese melts. Delicious! 1. Spread peanut butter on both sides of the bread. Apply peanut butter and add remaining ingredients! Thinly slice tofu and grill on stovetop grill pan until golden. I like to take the tortilla and toast it, spread it with 1 TBSP of peanut butter and put on 4 thinly sliced pieces of tofu. Fold in half and slice in two. You can just wrap it and take it with you! You can prepare tofu ahead of time and just use at room temp or make sandwich, store in fridge, then just take with you. Delish and filling! 3. Slice the tomato into thick even rounds. 2. Spread the peanut butter over one slice of bread. 3. Layer the other ingredients on the other slice of bread starting with leafy greens on the bottom, tomato slices, then sprinkle on the salt and pepper. 4. Assemble sandwich by joining the two slices of bread together, cut in half and enjoy with hot green or black tea! While “Peanut Butter Boy” sounds like a superhero name, I’m only human so if I’ve forgotten anyone’s submission please let me know! Also, hope ya’ll don’t mind that I touched up and tweaked your photos a bit. Great round up! How did you choose a winner? they all look so tasty! Congrats to Brilynn. She is awesome! Awesome! All the recipes look SO good!!! Thanks for a great contest! Congratulations to the winners! Each recipe sounds great! Thank PB Boy. Great recipes. Everyone was so creative. Congrats to the winners and many thanks to the organizers of the Exhibition! Mmm, I want a waffle-wich right now! The waffle puts my Wasa cracker-based entry to shame ;-) What a festival of peanut butter recipes! WOWZA, LOVE IT ALL!! CONGRATULATIONS TO THE WINNERS!! Ooh! Awesome sammie’s. I DO really want to try that Smores–NOW! Great round up, Nick. Thanks for squeezing me in. Mmm delicious. I’ll be craving peanut butter aaaalll morning now. I can’t wait to get cooking. These recipes look amazing! Yum! Did you see the peanut butter kids creation showdown on the Today Show? Peanut Butter po boys, peanut butter fruit pockets, kabobs more….yum! Oh my god, I am on delicious overload! It all looks so amazing. My jaw is slack with disbelief at the amazing amount of creativity everyone had. Congratulations to the winners, you deserve it! Ha ha! PB and pickles sounds like every pregnant woman’s food fantasy! The recipes look amazing! Thanks for having the contest, it was fun. Congrats to the winners! These recipes are incredible! Thank you so much to all four of you for hosting such a fabulous exhibition. I have more incentive than ever to enter the next one – it looks like so much fun and I can always use an excuse to eat more peanut butter!! Congratulations to the winners!! I second Dawn’s comment above. I am about to run home and have a peanut butter filled lunch! OH MY GOD. I need more bread! and some waffles! I’m truly speechless over this Peanut Butter heaven. Their all winners in my book!! Tough job you must have had! Thank God it wasn’t a real-life contest… I’d have been very sad to lose you from a peanut butter overdose! Great idea on the contest, I’m SO happy you had great turn out and thanks for encouraging people to think outside the peanut-butter-jar and feed the world these amazing creations! Thanks for such a fun contest, my husband and I are are very excited to see that we came in 2nd place. Congrats to all the other winners. What a fabulous round up! Congrats to all the winners, too! Everyone’s treats look and sound delicious! Thanks for doing this contest! I look forward to working my way through the recipes to find new favorites. 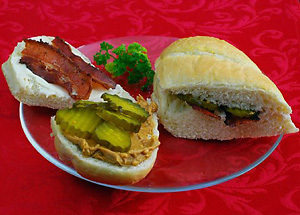 Although, the pickle/bacon/mayo/pb one frightens me a little. LOL! What a creative group of readers you have. My hat’s off to everyone. I love your blog title! I’m having a PB contest if you are interested! i cannot wait to try all of these recipes!! p.s. dont be shocked if one day i just show up at your front door with a spoon expecting some peanut butter from your ever growing stash. so serious. Hayley from buffchickpea turned me on to your site because she mentioned chocolate peanut butter in one of her posts, and I went nuts (!) over the reference. I love peanut butter and chocolate desserts (I like to use Trader Joe’s Unsalted Crunchy), so I’ll be back….Please come look at my new site–there’s one peanut butter and chocolate dessert that’s very good! Never have I had such a strong craving for a peanut butter sandwich! There’s a lot of sandwiches here! 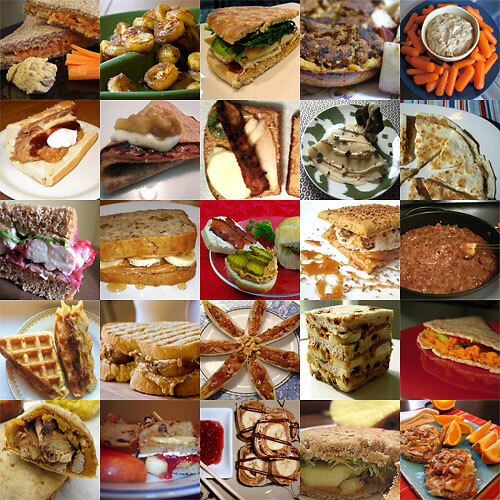 I’d probably want to try making any of these and go for an all-week sandwich meal.